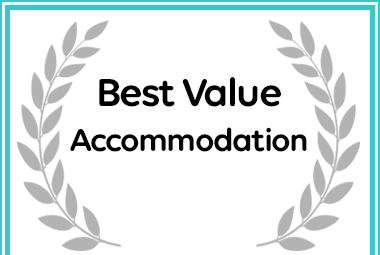 Afristay has named African Dreams as a Best Value Cape Town Destination. After purchasing the house in 2001, the owners Fanie and Jeanette Geyser made a few minor changes and turned it into a guest house where their guests feel at home. Set on the slopes of Table Mountain in the heart of Camps Bay, African Dreams Bed and Breakfast Guest House boasts a spectacular view of the Atlantic Ocean. A mere stone’s throw away from Cape Town CBD and the gorgeous Camps Bay beach, we will happily help you to plan your activities during your stay. We have received endless praise for our hospitality and willingness to help guests in planning trips and excursions all over the Western Cape and, aim to make African Dreams your home away from home. Our guest house boasts an incredible 180 degree view of the Atlantic Ocean, the beach and the mountainside. Watching the sunset from our verandah is something not to be missed. We are convinced that each sunset is more beautiful than the last and that our collection of photographs over the years just does not do the experience justice. Allow yourself to be pampered or simply lie back and relax at the pool with a cocktail, taking in the amazing panoramic views of the mountain and shimmering beaches. African Dreams combines outdoor living with excellent facilities and services, as well as a unique and warm South African charm.